The FrontPage Extensions for Apache have security issues and bugs. FrontPage itself has been discontinued since 2006. We, therefore, recommend that you don’t install FrontPage Extensions on a site if at all possible. There are alternatives for every bit of functionality it provides. 1) If you really need to install the extensions on a site, go to the FrontPage category. 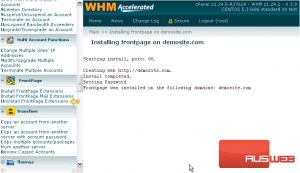 2) Click Install FrontPage Extensions. Warning: Installing FrontPage Extensions on account will delete its .htaccess files, which contain directory configuration info and password information. You will need to reconfigure any protected directories after FrontPage extensions are installed on an account. 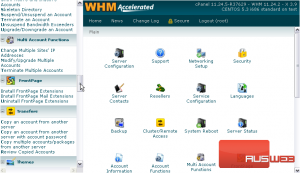 3) Select an account’s domain or username from the list, or search for an account below. That’s it! FrontPage Extensions have now been installed for that account. To uninstall the extensions, use the Uninstall tool in the menu in the exact same way. This completes the tutorial. 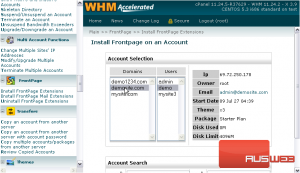 You now know how to install FrontPage Extensions on an account in WHM.